Whatever this pedestrian text may be, it's not the eyewitness testimony of a significant player in the cautionary drama of Drexel Burnham. Stone was employed (to do commission-dollar business with institutional clients in equities) at the lower Manhattan office of the now bankrupt securities concern that made junk bonds a byword on Main Street as well as Wall Street. While the author's eight-year tenure coincided with the firm's heyday, there's no indication that he had any substantive contact with the high-yield debt operation led by Michael Milken from Beverly Hills. 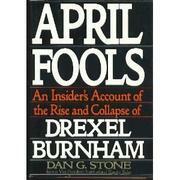 In addition, Stone apparently never met anyone on the job he could or would call upon for insights into Drexel Burnham's swift ascent and precipitate fall from grace as the most prominent casualty of the 1980's insider-trading scandals. Beyond a handful of on-the-record comments from corporate executives, his largely lifeless account of the vaulting ambition of the upstart enterprise and its resident superstar, plus their comeuppance at the hands of determined federal prosecutors, relies either on unidentified sources or (the evidence suggests) contemporary news reports. Nor was the author in at the kill: he had resigned months before receivership put thousands of his erstwhile colleagues out of work in February. An obvious short-sale candidate while waiting for the savvier narratives sure to appear in the wake of a consequential investment bank's convulsive demise.